Interior rending showing new gym on basement level. View is west towards main entrance off Wabash Avenue on left. From 2009 Wabash Green Feasibility Study (concept study). The Friends of Sorauren Park are holding a consultation January 31, 2019 on the plans for the Wabash Community Centre. This is the first step in our efforts to aggregate community input and formulate a summary report to submit to the City of Toronto later this year. Sign up to attend… your responses will help us greatly to plan the event. If you signed up earlier, no need to do it again… we’ll be in touch. The all-volunteer, non-profit Friends of Sorauren Park, incorporated as the Wabash Building Society, has advocated for the enjoyment and completion of Sorauren Park since 2006. Among our accomplishments: Fieldhouse (2008), Town Square (2014), Bake Oven (2017) and festivals, outdoor movies and the natural ice rink, among other free programs. 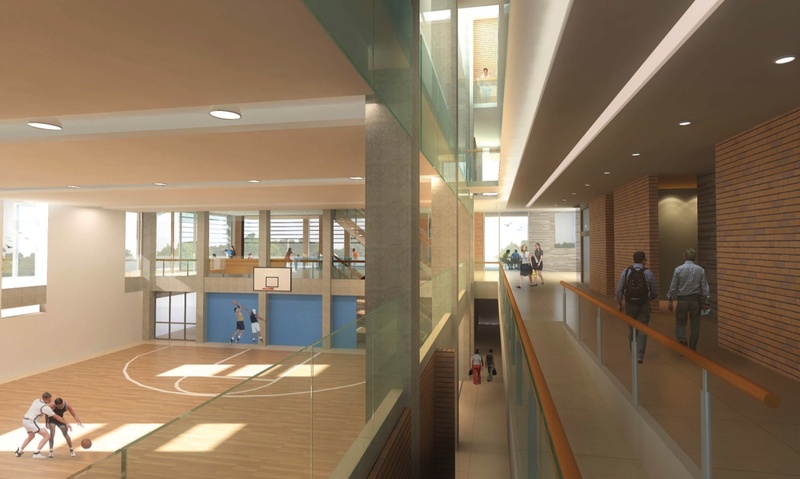 The consultation will take place at the Sorauren Park Fieldhouse starting at 7 pm, January 31. Sign up today! The Friends are undertaking this community-driven public consultation process to parallel efforts of the City of Toronto. The community effort will be meaningful, organized, transparent and respectful. The resulting findings and recommendations will be presented to the broader community and the City. 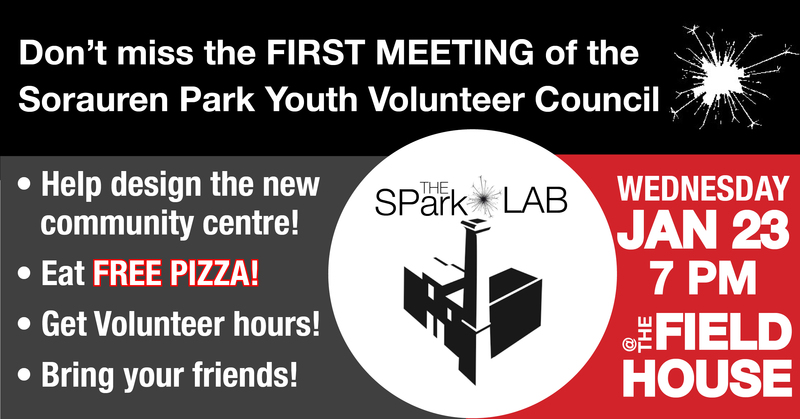 Check out new park youth council – free pizza! Are you aged 14 to 18? Are you looking for a way to get involved in the community and give your ideas about the new Wabash Community Centre, create events, run festivals and outdoor movies, or just help out? Meet up at the Sorauren Park Fieldhouse at 7 pm on Wednesday, January 23 and we’ll get started! Please click the Going button on our Facebook event so we know to expect you and can order pizza and drinks. Yes! There will be free pizza! Brought to you by the Friends of Sorauren Park. The City has announced the first public consultation for the new Wabash Community Centre at Sorauren Park. It will take place July 10, starting at 6 p.m., at Bishop Marrocco / Thomas Merton Catholic Secondary School at Bloor and Dundas. Please attend to provide your input and show your support for the new centre, for which the community has been advocating since the early 1990s, most recently by the Friends of Sorauren Park. The City has budgeted $40 million for the project. The province recently promised an additional $3.3 million towards aquatic facilities. The City of Toronto is building a new Community Centre on Wabash Avenue, located just east of the fieldhouse in Sorauren Park on the site of the old Linseed Factory. 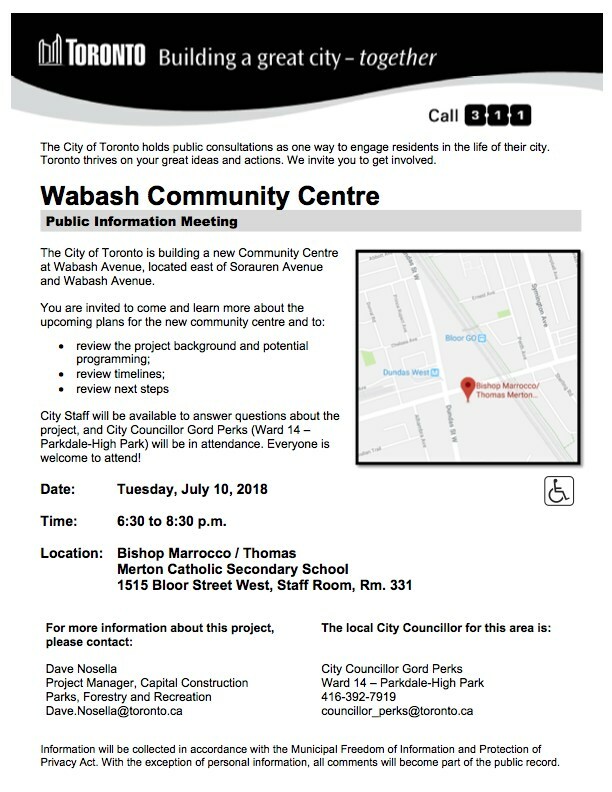 Please join me for a meeting with community members and City of Toronto Parks staff to discuss the Wabash Community Centre. Community input is essential when deciding how best to improve public spaces and this meeting will serve as a great opportunity to hear from you. This will be the first of many community consultations. Please see the flyer for more information. This site is accessible. If you have any questions or are unable to attend the meeting and wish to share your concerns, please do not hesitate to contact my office at councillor_perks@toronto.ca . Look forward to seeing you on July 10th at Bishop Marrocco for the first of many community conversations. Toronto City Council has voted to start work this year on the Wabash Community Centre at Sorauren Park. Work will begin with a modest $50,000 budgeted for pre-engineering. That will be followed by design in 2018 and 2019, with shovels in the ground planned for 2020, towards a 2022 or 2023 opening. Total project budget is $32.4 million. The Friends of Sorauren Park recently concluded its “Unlock the Community Centre” awareness campaign, the latest in a long series of actions to advocate for the centre. The project is included in Parks, Forestry and Recreation’s capital budget and plan, which City Council approved Wednesday, February 15, 2017, as part of the overall City budget. The most recent plans for the community centre, prepared as part of a 2009 feasibility study, would convert the abandoned Canada Linseed Oil Mills building next to the park into a 40,000 sq. 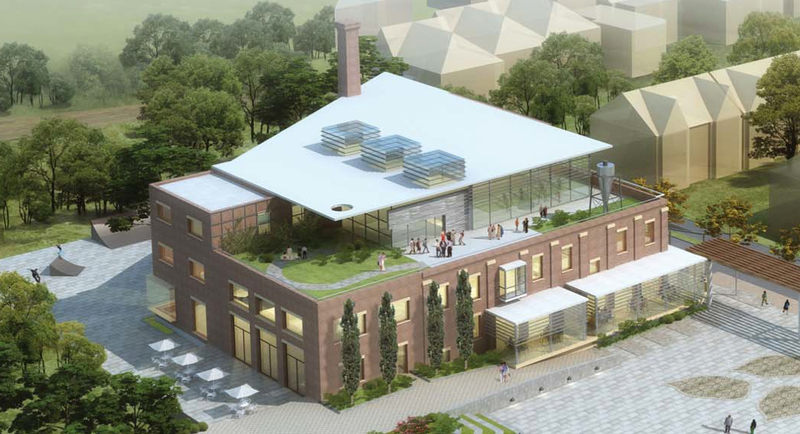 ft. community hub with a gym (shown above), multipurpose rooms, studios and fitness rooms, youth space, kitchen and third-floor event space with a rooftop terrace. Follow us on social media @SoraurenPark, our website and this newsletter for updates and news on design consultations. Friends of Sorauren Park would like to thank Councillor Gord Perks, along with previous Ward 14 councillors Sylvia Watson and Chris Korwin-Kuczynski, who all moved the project along at various stages at City Council. Most of all, thanks to the community, which has advocated ceaselessly for the community centre since the early 1990s. Never stop believing. TORONTO, ON – February 13, 2017 – The Friends of Sorauren Park (FOSP), the non-profit organization dedicated to the completion and enjoyment of Sorauren Park, announced today the successful end of its Unlock the Community Centre campaign, launched in 2016, to rally community support around the City’s pledge to invest $34-million in building the Wabash Community Centre. 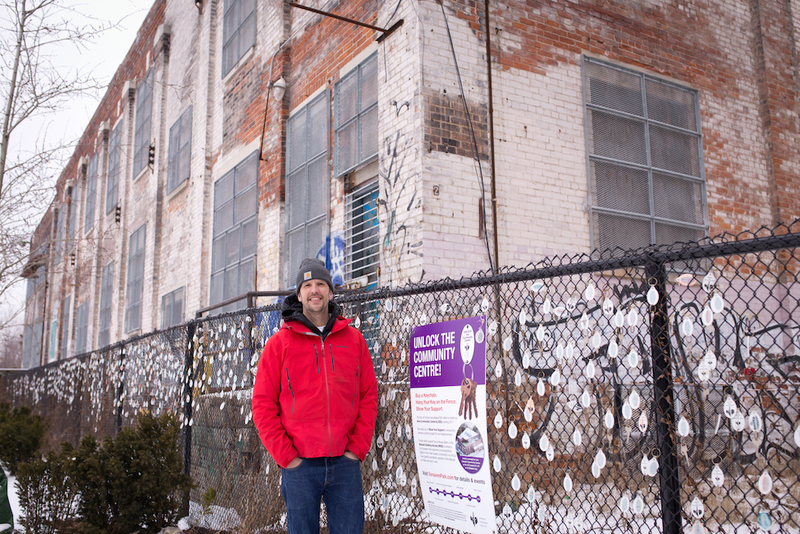 More than 2,000 residents and students from neighbourhood schools purchased keychains, decorated them and hung them on the fence next to the long-abandoned flaxseed factory – the proposed site for the new Wabash Community Centre. Local businesses including Scooter Girl toy store and Sunny Joes coffee shop supported the effort by making keychains available for purchase in-store. “The Unlock the Community Centre keychain awareness campaign was inspired by the ‘Love Locks’ on the Pont des Art in Paris,” noted Joël Campbell, the Chair the FOSP Board. “We wanted to show a visual representation of community support and raise awareness. With thousands of keychains now on the fence, we are delighted with the results,” added Campbell. 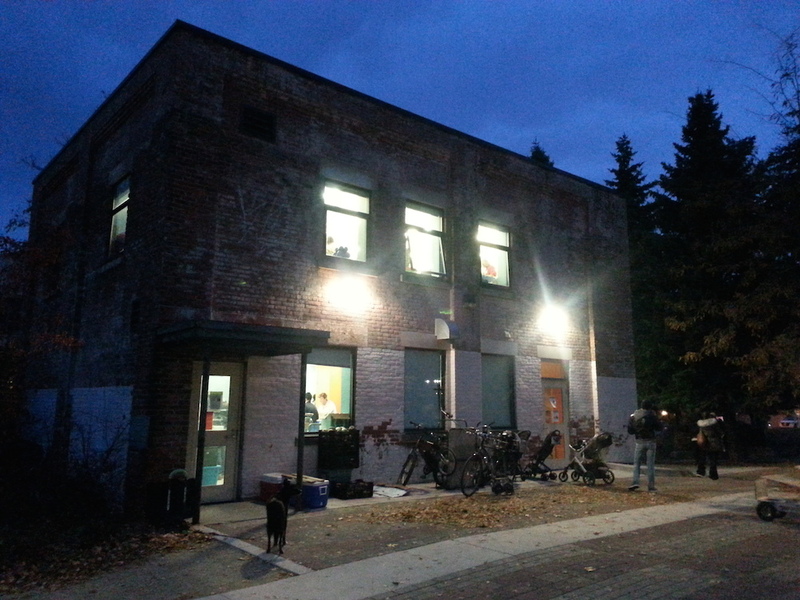 The local community has been advocating and campaigning for the community centre since the early 1990s, and it has been a project on the City’s books for at least 17 years. During that time, FOSP has raised or leveraged approximately $750,000 for park development including the Fieldhouse and the park’s Town Square. The Wabash Community Centre is currently included in the City of Toronto’s proposed capital budget scheduled to be voted on by council at its upcoming Feb. 15-16 meeting. “We are encouraged that we are in the proposed budget and that the development process is scheduled to begin later this year. With completion scheduled for 2022, one year earlier than expected, residents are very excited that the Wabash Community Centre is closer to reality,” said Campbell.